Why learn how to love yourself more? How can it help you find your soulmate? You've probably heard that you need to love yourself to find true happiness and fulfillment. You're probably aware that loving yourself affects your career, your relationships and your future. You may even have read my book where I discuss how loving yourself is a part of attracting a specific person. Thus, you're aware that the most important relationship that you need to focus on is the one with yourself. Yet, it's easy to neglect your relationship with you. To help you nurture your relationship with you, I encourage you to follow these tips on how to love yourself more. They help you evolve your life no matter where you are. 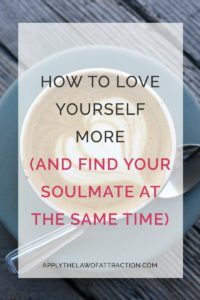 And for those of you looking for your soulmate, you'll discover how loving yourself allows you to manifest your soulmate. Loving yourself is the first step on your path to peace and happiness within. If you don't know how to love yourself, admit it. That's the first step. It's okay. You don't need to know how to love yourself. Loving yourself begins with just feeling love. It doesn't have to be about anything in particular. Once you have that feeling, begin to look at what you want in life. Be willing to love and respect yourself enough to go after your dreams rather than do what is expected of you. Stay focused on your goals, avoiding the negative patterns and habits that have held you back in the past. Take care of your body. If it needs sleep, sleep. If it wants to move, let it dance, run, skip, or whatever it enjoys. If it wants food, give it the food it wants. Set healthy boundaries. Be willing to say no to things that could hurt you physically, emotionally, or financially. Stop patterns of abuse, even those coming from toxic people. If there are people who harm you or who will not respect your boundaries, remove them from your life. It doesn't matter if it's someone you just met, your boss, or a family member. Heal your past wounds. Most of us carry around pain in our hearts or negative emotions, such as fear, anger and frustration. Get the help you need to remove them so that you can open your heat to loving yourself even more. And, most of all, love yourself right now exactly as you are. You don't have to wait until you get things right, until your life is perfect, or until you meet a certain standard. You are worthy of love right now in this very moment! When you love yourself more, you attract friends, co-workers and a partner who reflect back to you the love you have for yourself. If you haven't manifested your soulmate, it isn't because you've failed at the Law of Attraction. 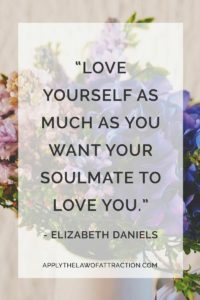 It's simply a sign to allow more love in – to learn to love and appreciate everything about you…to love yourself as much as you want your soulmate to love you. Treat yourself with the loving care and kindness you would like to receive from your soulmate. Loving yourself is the first step to being your own soulmate which then allows your soulmate to enter into your life. You must make yourself your highest priority so that you don't need to find love outside of yourself. It's when you no longer need to find love…when you're no longer looking for your soulmate…that your soulmate will show up. When you love yourself, codependency goes away. You release all attachment to having to find your soulmate and you release any fear of commitment. When you're with your soulmate, you love your partner. But when you're apart, you have all the love you need within you. You are the same person without your soulmate as you are with your soulmate. You don't feel the need to act or be differently from who you are. You love yourself so much that you know that who you are is enough. When you're with your soulmate, there isn't a need to cling. You're with each other as long as you choose to be together. If there comes a time where you are no longer happy, your soulmate will let you go because they love you so deeply that your happiness is more important to him/her than forcing you to stay. Your soulmate isn't insecure or jealous if you need some alone time. Your soulmate wants what's best for you. That's the love for yourself that your soulmate will mirror back to you. But it all begins with you loving yourself more. Hi Elizabeth! I love your book on manifesting love. I read it within one day! I have a question though in relation to inspired action. I read on this blog that we can’t just sit around manifesting, that we also have to take inspired action. If we are manifesting love with a specific person, and we aren’t meant to contact them and in my case they live overseas (similar to your manifestation with your love), what kind of inspired action could I really take? Also in relation to detachment and being open to attracting someone other than your specific person, I was wondering if it is possible to attract someone more suited even though you are doing daily visualisations which include your specific person? I would like to attract a specific person but I don’t want to close myself off from potentially meeting someone better. Inspired action is about what you’re inspired to do. You should follow your inspiration and also reread Elizabeth’s book, especially the part about contacting your ex. The answers are in it. Natalie is right about inspired action. Thanks!